The all-important question of packaging – what’s your take on this? Packaging, gift wrapping, gift presentation, call it what you may but its the gilding of your product: the decoration, embellishment, ornamentation, beautification, prettification (yes, it is a word! ), trimming, enhancement, I particularly like titivation! How do you package your offerings? Obviously packaging and gift wrapping are extremely important but what percentage of the total cost of your product should go into the packaging component? That’s my conundrum …… I believe packaging is really important, and should enhance not take away from your gorgeous product. 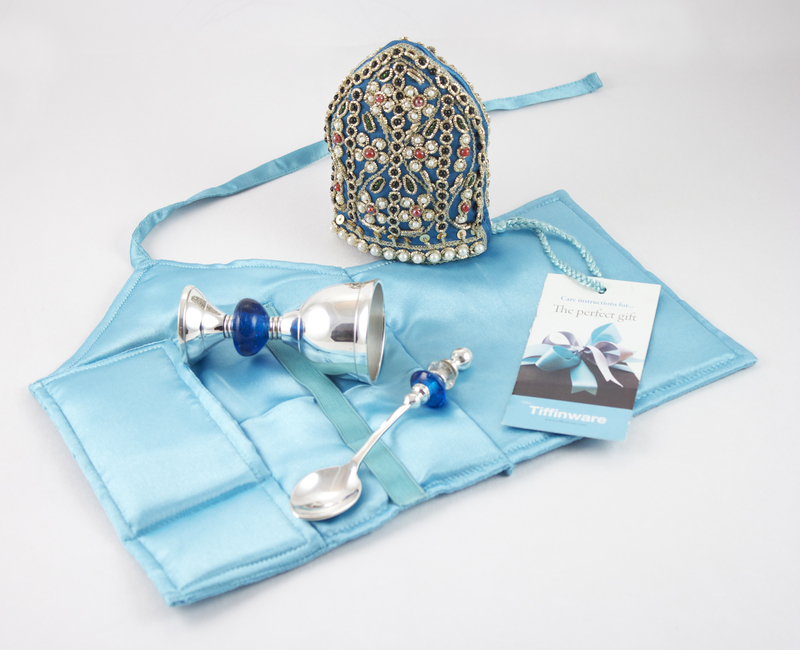 Luxurious, handmade bespoke packaging for every Tiffinware product, so each time you use your purchase, you feel like you’re opening a gift! 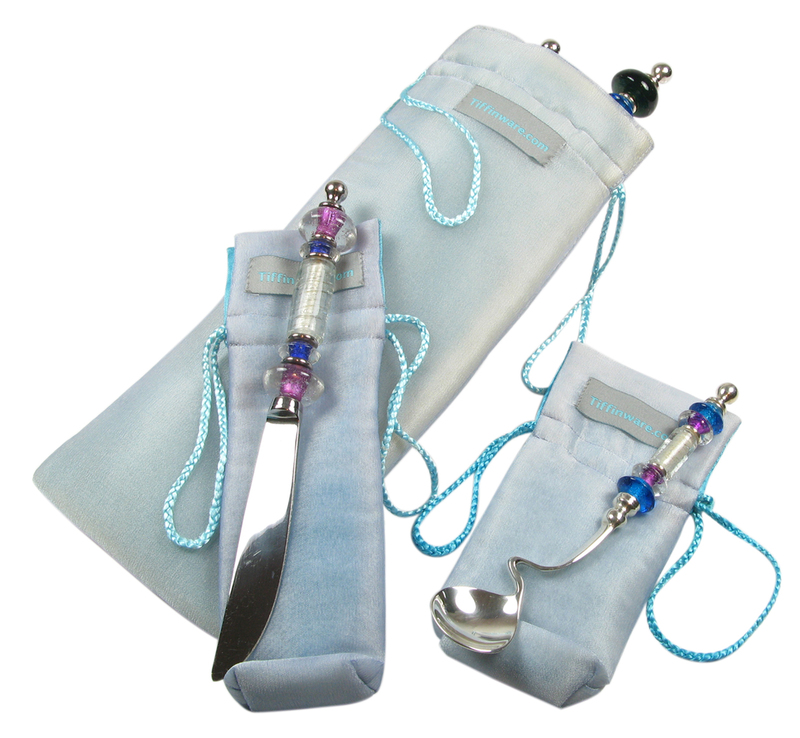 Here at Tiffinware we develop the packaging as we design and develop a product. Early on we decided to steer clear of the usual Gift wrap ‘box,’ looking for an exotic option that matched our equally exotic product. 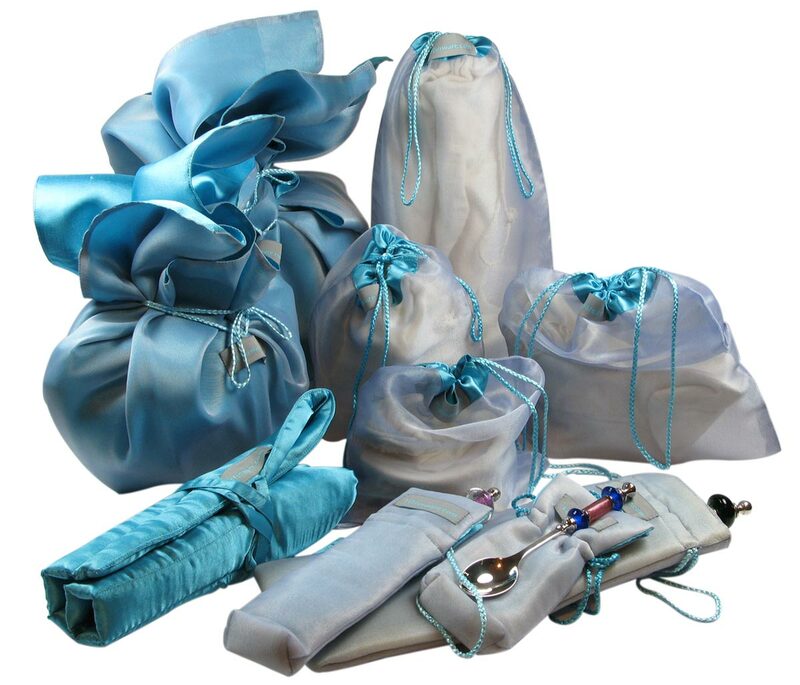 We came up with these beautiful silk satin and organza padded pouches, that serve two purposes: offer protective padding – the packaging, enhance the look and feel of the product and act as gift wrapping which improves the experience of opening the ‘gift,’ gives you a feeling of being spoilt when unwrapping a rich luxurious parcel – we do try to ‘give something different!’ The best part is, you don’t have to gift wrap our products, we believe our delicious packaging is sufficiently inviting! And we don’t charge for our lovely packaging!! The first packaging we developed were options for gift presentation too, we think they work well. The feedback from our customers has been positive so far……. What do you think? 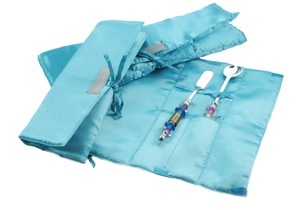 Silk satin double item gift wrapping option. This really is having your cake and eating it too! 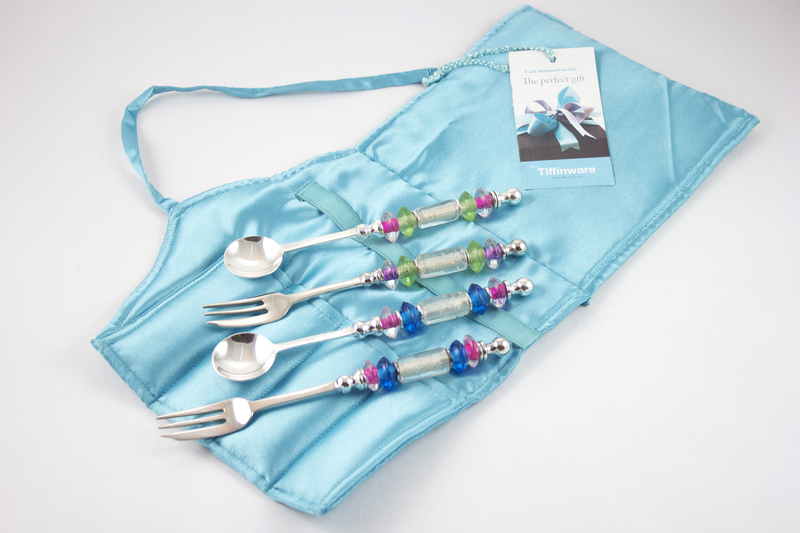 Matching cake forks and teaspoons with personalised beads of your choice. The new kid on the block is the two piece: ( itsy-bitsy, teeny, weeny – could be yellow, but not polka dot, I’m afraid, unless I get Beata Gillis back – lamp-worker extraordinaire!!) 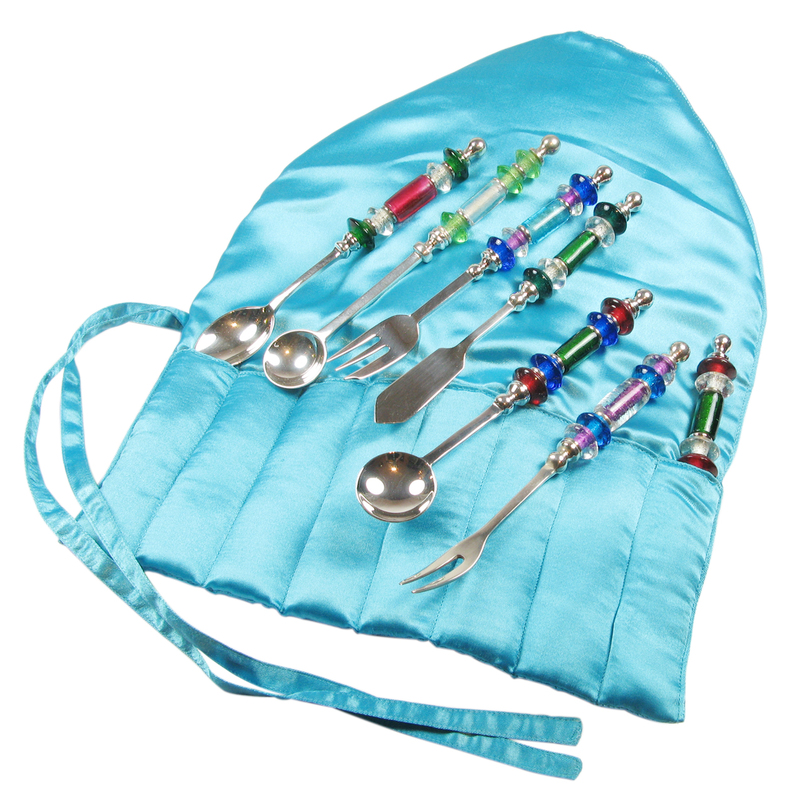 Egg Cup and Spoon holder which can accommodate the Egg Cosy too – cute? That’s all for now folks! Our packaging and gift wrapping story – what’s yours? !